In looking at new ways to help wine 101ers learn about wine I remembered that in the weeks I was studying for my WSET (Wine and Spirits Education Trust) test I asked the other students to my home for some group study meetings. During one of those sessions one woman had found a really cool website that had a multiple choice quiz. As you answered the questions correctly you would get harder and harder questions. It really did help my education. 1. What is the average alcohol percentage for wine? c. While both domestic and European wines hover between 13% to 15% alcohol content, some wines are a percentage below or above. 3. True or False: Champagne from Champagne, France, is the same as what we call Sparkling wine made anywhere else. 4. The color of red wine comes primarily from what? a. The entire grape, red or white. b. The length of the skin contact in the winemaking process. a. “…were common names for red and white blended wines in the United States about five decades ago. c. “…are primarily made from Pinot Noir (Burgundy) and Chardonnay (Chablis) grapes. 6. True or False: An Australian Shiraz and a United States grown Syrah are the same grape but grown in different countries. 7. What is the most famous wine grape growing region outside of United States’ Napa Valley? 8. Of the wine regions listed above, which region is the most known for making Champagne? a. You ordered a wine that you’ve never had before, and you don’t like it. b. TCA cork taint, where the cork is faulty and the wine has a wet cardboard mildew smell. c. You now regret the that price you paid. 10. When can you send wine back that you’ve already sampled? a. You don’t like it. c. You didn’t see the price. 11. 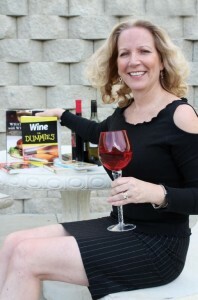 How often to you read Eve’s Wine 101? b. All of the above. c. What she said ^^. Answers: 1: c, 2: a, 3: False, 4: b, 5: d, 6: True, 7: a, 8: g, 9: d, 10: b, 11: a, b and c!